After a few days of pouting over my dyslexic painting/dimpling/edge-breaking incident (and a day of flying) I finally was able to stomach the idea of getting back to working on the side skins. Today's plan was to strip the offending paint off of the skin, drill out the twenty rivets holding in the nutplates, reverse the direction of the dimples and the edge-breaking, paint the correct side of the skin, replace the nutplates, and watch football if there was any time left in the day. 9:00 am found me standing in the spray paint aisle at Lowe's forcing myself to buy another can of the Rust-Oleum that I hate so much. I know, I know, but I have no choice. I'm committed now. And hey, what are the odds that I'd get another stuttering can? Surely that was just a fluke. I'm finding that working at the airport has its distractions. One of those is the fact that there are airplanes there. Another is that different airplanes come in and out. 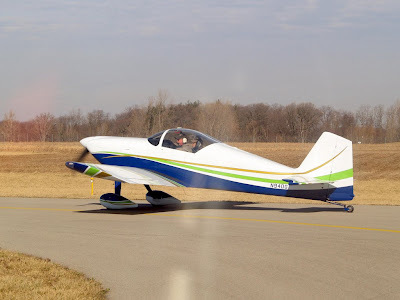 As I was driving down the entry road, I saw what looked like a brand new RV-7 taxiing in. There was also a pretty RV-8A parked out on the ramp. I figured I could spare a few minutes (okay, the full truth: I was in no hurry to get the hangar and slog through hours of stripping off paint) to stop and say hi. The RV-7 pilot was there to meet and pick up another guy, after which the both of them would fly to a fly-in down south in Vinton County. I've been to that fly-in; it was one of the reasons I stopped going to fly-ins, as it turns out. I went in 2006 and 2007 and both times had something happen with the crowded landing pattern that just turned me off of fly-ins at uncontrolled airports. Anyway, I walked up and introduced myself to the RV-7 pilot, whose name turns out to be Joe. And, oddly enough, it was another one of those cases when I introduce myself and the reply is "Oh, I've heard of you." Quick, what's the first thing you think when that happens? Right: good or bad. It reminds me of a time soon after the company that pays me to work was acquired by a Fortune 15 mega-corporation. I was at a business dinner with some folks from corporate headquarters when one of them made the comment that I already "had a reputation at corporate." Read into that what you will - I sure did! It also turns out that the passenger is the father-in-law of the CFI that did my tail wheel transition five years ago when I bought the RV-6. I showed him a picture of the plane and he told me that he thought he had repaired a wheel pant from that plane. He had, in fact. I broke one of them on the runway at Bolton when I was still struggling to learn how to land it. Funny how people came out of the woodwork after that incident to tell me that they had thought about suggesting that I remove the pants until I get better at the landings, but for some reason didn't. I remember struggling to keep the tone of sarcasm out of my "well, thanks anyway." The big news here, though, is that he paints airplanes. He painted an RV-6 that's also based at Bolton and I've always thought it to be a very pretty airplane. He offered to do my -12 when it's ready and I think I'm going to pursue that path next year. Having put it off for as long as my conscience would allow, I finally made my way to the hangar to start paying penance for my carelessness. While it was the paint stripping that I was the most reluctant to start, there were a couple of other not-very-fun things to get through first. Chief of which was the drilling out of twenty blind rivets. It's normally not very hard to drill out blind rivets, but these are the little tiny ones that I hate so very much. They seem like they ought to be easy to work with, but they're the ones that have the irritating proclivity to break off in the rivet puller and leave a piece of the mandrel sticking out of the hole. I figured it was going to be tough to deal with the piece of mandrel that was still stuck in three of the rivets. That actually turned out to be easy. I just used my modified Harbor Freight center punch to knock the mandrels out through the other side. No good can come without an offsetting bad, though. It's a law of metaphysics or something. The bad in this case came when I tried to drill out the rivets. Instead of the drill bit cutting into the rivet, it just caused them to spin in the hole. After a few enjoyable minutes of pouting, I figured out that I could hold the other side of the rivet in place with vise grips. That seemed to be working fine. I got about three of them done before the battery quit in the drill. I hunted around for the other battery, found it, plugged it in, and found out that it too was dead. Figures. I'd have to press on with the air drill. I finally got all of the nutplates out, but was confronted with a whole new reason to hate those little buggers. They wouldn't come out of the nutplates! Sigh. Back to the vise grips and the drill. None of this had done much to improve my mood, so I had to dig deep into my ever-waning pool of self discipline to force myself to get on with stripping off the paint. The first third went very slowly as I'd pour on some MEK on the skin and then rub like blazes to get the paint to come off. I eventually realized that I was doing it wrong. I learned that it's better to let the stripper do the work and just sit back and watch the show. Oddly enough, this lesson seemed reminiscent of a very similar lesson that I had learned years ago, back in my young, more unruly years. I can't quite seem to put my finger on what that old lesson pertained to, precisely.... but I'm sure it will come to me. In any event, the secret was to pour on some MEK and wait a minute or two for it to really dig in and wrinkle up the paint. Once that had happened, it wiped right off with very little effort at all. With the paint finally gone, I did the reversing of the dimples and the re-breaking of the edges. I hung the skin back on to see how it looked. Much better! I had to put it on and take it back off a few times to do some more adjustments to the longeron (another half dozen trips to the vise, thank you very much) before painting it. Once I was as satisfied with the fit of the longeron as I'm likely to get, the skin was finally ready to have the new paint applied, this time on the correct side. I grabbed my brand new can from Lowe's and started to paint. Do you have another photo of that red-white-blue RV-8A at the top of this post? I'd like to see more details of that paint job. I am nearing completion of my RV-12 tail kit! Bill H.
Oh, Bill, I was just thinking the same! Isn't that a pretty paint scheme? Thanks for the link! The reason I wanted to comment though is to tell Dave that I'm feeling with you, man! Nothing harder than to face your mistakes and trying to fix 'em. Nice job, despite all the bad odds! dave you've said it takes longer to write than read but thanks for taking the time. some of us slow readers had to read the paint stripping part twice before laughing out loud.